PROMT for MS Office is a convenient tool for translation in Microsoft Word, Excel, Power Point. With its help, you get document translation without leaving the program you are using. IMPORTANT: This Software may only be used for personal purposes in a non-commercial environment (that means at home). Improved translation algorithms, updated dictionaries and unique PROMT translation technology, provide the best quality of machine translation from and into English. Scientific articles, legal agreements – all documents you need for work, you can read in the native language or instantly translate for your friends and partners. To translate, you don't need an Internet connection. Your personal data and any translated information will not be disclosed to the third parties. Quickly grasp the overall idea behind texts and documents written in a foreign language. Translate with minimum effort in any Windows-run program or application. NET Framework 3.0 (installed automatically). One word or a whole text, in the PROMT interface or in any program – translate with one click! Simply select a word or a text fragment, click a "hotkey", and the resulting translation will appear in a popup window of PROMT Agent. PROMT Agent will help you to be quick on the uptake on any website and view information in documents of any format instantly! PROMT Translator linguistic editor is the heart of the application, which allows it to translate texts of any complexity. You can even get a complete translation without customizing the system: simply add some text to the translation pane and click Translate. The source text is displayed in the top area of the editor and the translation is displayed at the bottom. The goal of such basic translation is to help you get the gist of the source text and decide whether you need to work further with it. Because of the new algorithms and vastly expanded dictionaries, PROMT for MS Office offers high-quality translation even in this basic mode. For an even higher-quality translation of texts with specialized terminology and highly specific lexicon, you have complete control over all translation settings: choose and edit profiles, enable dictionaries—built-in or additional dictionaries from PROMT collections. 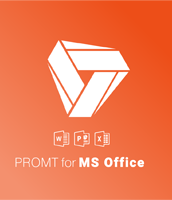 Setting up PROMT for MS Office is very easy and does not take much time. PROMT for MS Office supports translation in the popular office suites, such as Microsoft Office XP–2016 (Word, Excel, Power Point). After installing PROMT for MS Office, the PROMT Translator tool will be added to the toolbar in these applications. With PROMT for MS Office you can create your own dictionary containing the lexicon of the topics you work with most often. Then you can enable this dictionary in PROMT Translator. You can freely update and edit user dictionaries in PROMT for MS Office. If you need to look up individual words, you will always have access to a dictionary with translation variants and grammatical assistance readily available. You can create your own electronic dictionary, for use either manually or automatically. This feature is very convenient for anyone learning a new language! To extend the basic capabilities of the application, you can purchase additional collections of PROMT domain-specific Dictionaries. Online translation from Arabic, Turkish, Chinese and Japanese is additionally included. Better translation quality thanks to the new intelligent algorithms, tested for news and technical texts, updated dictionaries and language models. The new version features online translation from Arabic, Turkish, Chinese, Korean(new) and Japanese. Online translation from Arabic, Turkish, Chinese, Korean (new) and Japanese is additionally included. Copyright © "PROMT", 2003 - 2019 . All rights reserved.